dining or just having cocktails. Grill available for cooking. The master bedroom is located on one side of the villa with a king size bed and linens. bedroom has a set of twin beds with a TV and full bath located just outside the door. refrigerator with ice and water available on the door. SATURDAY TO SATURDAY RENTALS ONLY JUNE AND JULY. HDTV Wifi Blue Ray dvd TV Master Bedroom/dvd/vcr TV in all guest rooms Deck w/grill and outdoor dining All bed linens and towels provided. Daily cleaning service provided for an additional cost. This property is very well appointed and just beautiful. Pat made sure that everything was just as it should be. She was extremely attentive to our every need. We will definitely being staying there again. We stayed in this condo in July 2018 and it was perfect. 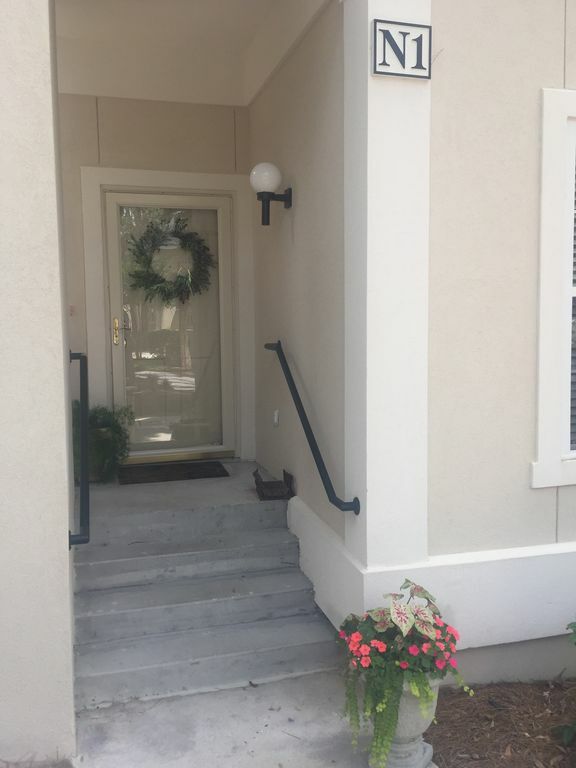 Very clean and great location! The owners were easy to work with! Highly Recommend! Wonderful home, location and owners! Thank you for your kind words. We’re very happy knowing you had a great family vacation to make lasting memories and enjoyed our villa. Please do , come back again! We had a wonderful experience staying at the the Golfmaster II property. The property was clean, comfortable, beautifully decorated and convenient to either end of the island. Hilton Head is a wonderful place to vacation, and the Shipyard is a great place to stay. The owner was one of the best I've ever worked with, extremely personable. Would stay here again! Thank you so much for your very kind words. We loved having you in our villa and look forward to your next stay. My family and I had a wonderful time. The property was clean and well stocked with everything we needed. The owner even provided access to the beach locker full of chairs, umbrellas, and beach gear. The owner was easy to contact, and available to answer questions we had during our stay. The beach, golfing and great places to eat were close by. We even took a short 45 min trip to Savannah, GA to take in the rich history there. I would definitely recommend and stay at this property again. The beach is 1.4 miles from the villa. You can be there in 10 minutes by bicycle or 5 minutes by car. The pool is a 4 minute walk from the villa. Rafts and pool noodles may be used in the pool. There are chaise lounges and tables with umbrellas. There are many golf courses located on Hilton Head Island, 3, 9-hole courses are located inside Shipyard plantation along with a practice range and restaurant which servers breakfast and lunch, beverage cart service and snack shack. Tennis Courts are located in each living area of Shipyard. The Van Der Meer tennis academy is in Shipyard. You can book clinics, lessons, and playing time through them. 50+ miles of bicycling and walking paths which connect all of Hilton Heads plantations, shopping areas, recreational parks etc. You can bike several miles in Shipyard alone. Weekly Rate: $1450 Jan-Mar 2018 Call for weekly rates. $1800/month April-December 2018 - $1450/week Rentals are Saturday to Saturday for summer months of June and July. Special arrangements for fewer days may be made within the Saturday to Saturday week period. Seven night minimum for June and July. Weekend rates available in low season Any other dates that are not listed, please contact me for rates. Rates are subject to change without notice. Only weekly rentals June and July unless there is last minute availability. Please contact me for special arrangements.